Vijay Kulkarni who studied fine art at Sir J. J. School of Art, Mumbai decided to dedicate his life to Ajanta paintings at an early stage in his professional painting career. The Ajanta frescoes are amongst the highest pinnacles achieved by Indian fine arts in its long, continuous march from pre-historic cave paintings to the contemporary art of the present day. Enough has been written about them � the masterful line-work, natural colours, primitive tools, the forms, the composition, the delicate delineation of emotions. In these dark caves with uncertain reflected lighting, a whole school of painting richly records the contemporary social mores, and in the tales depicted, the highest and noblest aspirations of mankind. "I, Vijay Kulkarni, have dedicated my life to the painting of reproductions of the world famous Ajanta frescoes. It�s my life�s mission to create for posterity a permanent record of these frescoes which face an uncertain future inspite of the best efforts of conservationists. 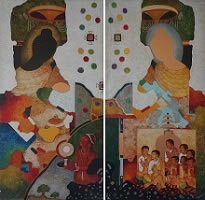 In my early years as a school student in Aurangabad, drawing and painting were my preferred pastimes. However, the first attraction towards the frescoes occurred much later in 1973. I got an opportunity then to study them in detail through a government sponsored two-month project during my undergraduate course at the Sir J.J. School of Arts in Mumbai. Increasing maturity, the encouragement of my teachers and a realization of the invaluable inheritance left to me by my ancestors who hailed from the village of Ellora, fixed my concentrated attention on the frescoes. Much later in 1982, I was fortunate to be able to set up my own art gallery in the close vicinity of the Ellora caves, and see there, and learn much, from the three - dimensional renderings of the two - dimensional forms at Ajanta. The Ajanta frescoes are amongst the highest pinnacles achieved by Indian fine arts in its long, continuous march from pre-historic cave paintings to the contemporary art of the present day. Enough has been written about them � the masterful line-work, natural colours, primitive tools, the forms, the competition, the delicate delineation of emotions. In these dark caves with uncertain reflected lighting, a whole school of painting richly records the contemporary social mores, and in the tales depicted, the highest and noblest aspirations of mankind. Though further damage to the frescoes by humankind has been curtailed, Nature continues to be unkind. Many of them have faded to the extent that it is difficult to visualize their contents. It is on such frescoes that I have lately started focusing, since, if they are not copied now, they will soon go out of reach forever. Some of them are unidentifiable Jatakas, others are fragmentary parts of larger compositions, still others seem to be purely decorative in nature. Most of them are rarely found in other reproductions, not having received attention because of their supposed unimportance. It is my belief that even the seemingly most unimportant of them should be preserved, for who knows, one of them may turn out to be a Rosetta Stone at some future time. In my reproductions I take care to copy the frescoes as they are, without extrapolating into areas of the paintings which have fallen off and left a bare wall patch. I try to maintain the same exact colour scheme as in the original, except that my colours are brighter, in an attempt to capture the full glory of the frescoes a they must have been when newly made. Ajanta frescoes have so many subjects, so much content, that it makes me glad to think that I shall be fully occupied over this lifetime. It makes me sad to think that one lifetime is not going to be enough for me to create the complete record that I would like to do."